The Jonas brothers are pretty much omnipresent these days.Â The three of them are all over the place and it looks as though their cultural influence is only growing.Â First there was the CD and then the appearances on different television shows and then the tour and the movie about the tour show.Â I thought they would have gotten their own television show a whole lot sooner, but now they finally have it and the first collection of episodes is ready for you to bring home on DVD today! Starting this September 22nd, now available on DVD from Walt Disney Studios Home Entertainment comes the first collection of episodes from everyoneâ€™s favorite band made up of three virgin brothers.Â JONAS â€“ Volume One â€“ Rockinâ€™ The House is ready to come rolling out of your television screen and fill your living room with laughter, music and a whole lot of fun.Â Bring home this new television show today! A grand total of seven television episodes are coming at you through this DVD and two of them have never been seen before.Â In addition to being huge rock stars and pop idols like few others these days, the Jonas brothers also live at home with their parents, do the dishes and have to go to school.Â Everything on stage goes so smoothly and seems just perfect, but things at home rarely go as planned.Â Of course, this takes the show in hilarious directions and if you like the Jonas brothers, those are places that you are going to want to follow them to. The special features included in this DVD are two episodes that have never been broadcast before, â€œBeauty And The Beatâ€ and â€œCold Shoulderâ€ and a â€œYouâ€™ve Just Been Jo Broâ€™dâ€ featurette where the brothers surprise one of their co-stars. As a bit of an aside, the South Park episode where they make fun of the Jonas brothers is one of the best episodes in the last two years.Â I loved it, but I didnâ€™t quite feel that way about this show.Â Now, Iâ€™m not in their target demographic and I donâ€™t like to start with, so take that under advisement.Â If you like the Jonas brothers, even just a little bit, then I am sure that you will greatly enjoy this television show.Â It gives you so much more of them than you have ever gotten before.Â Of course, itâ€™s not real life and itâ€™s still a scripted show, but you have to make the lives of three virgin brothers who hardly ever even say Golly a little more interesting.Â But check it out, because it will be very enjoyable for true fans of those three boys. Turn up the Volume with this DVD today! 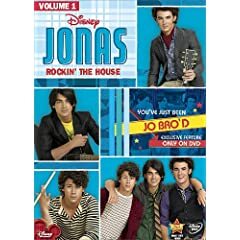 2 users commented in " Movie Review: JONAS â€“ Volume One â€“ Rockinâ€™ The House "
I’m not in Disney’s target demographic age wise. But my family (all ages) enjoys watching television shows that are both entertaining and clean. The Jonas Brothers do this better than anyone. It appeals to ALL ages. We watch this show each week and are happy to have a few of the episodes on DVD. Yeah, the typification of these guys as “three virgin brothers who hardly ever even say Golly” is really overblown. It’s based on a lot of assumptions and not a lot of reality. The goofiness of the show is enjoyable and, yeah, it’s a kids/family show so there’s no cursing. Big deal. We can’t all be ridiculous hipster icons like the Flight of the Conchords. And some of us are so tired of that crap we’re happy for other options.